Client-Centered Practice in a Computer-Centered World: The Place for Technology in Social Work Practice – Challenges, Opportunities and Future Steps” 2014 Vol 53. Issue 4. 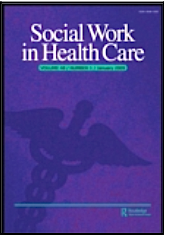 This special issue of Social Work in Health Care was sparked by a two day colloquium in the fall of 2012 an spring of 2013 entitled “Social Work Practice in the Digital Age” sponsored by the Helen Rehr Center for Social Work Practice. The proceedings of the colloquium are posted next. The special issue can be ordered through Taylor & Francis online.